Use Untrim to remove a trimming boundary from a surface. 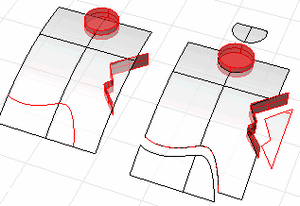 When you split a surface with a curve in a plan parallel view like the default Top, Front, and Right view, the cutting curve is projected on the surface in the view direction. When you split a surface with a planar curve in an angled parallel or a perspective view like the default Perspective view, the cutting curve is projected on the surface in a direction perpendicular to the curve plane. When you split a surface with a 3-D curve in an angled parallel or a perspective view, the cutting curve is pulled onto the surface by closest points. Use the Int object snap for snapping to isoparametric curves intersections. Splits a surface with isoparametric curves in the surface u direction. Splits a surface with isoparametric curves in the surface v direction. Splits a surface with isoparametric curves in both u and v directions. Toggles the direction between u and v directions.